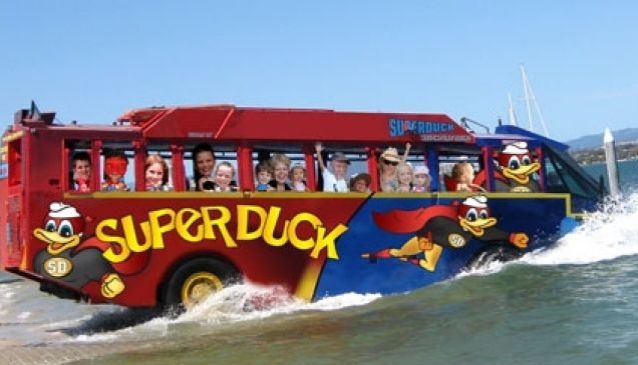 The Superduck Adventure Tour, one minute you are driving on the road enjoying the sights of the Gold Coast, when SPLASH! now Superduck is in the water and is a boat! Views of Surfers Paradise can be seen as well as the parklands along the Broadwater and in the distance, glimpses of the Gold Coast Hinterland. Out of the water and back onto the road you head back to Appel Park where your adventure started. The tour takes approximately 1 hour and runs 7 days a week. The first tour is at 9am with the last tour departing 5.30pm. Souvenirs can be purchased on board.